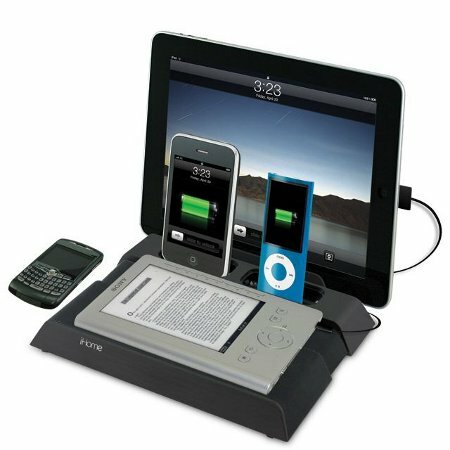 The iHome iB969 charging station might seem more of the same old to you, but it is different in one aspect – this charging station not only charges your iPod and iPhone, it also caters to the recently released iPad alongside BlackBerry devices as well as e-book readers, now how about that? The iPad charges via a unique built-in stand that you can see above, while dual universal docks allows you to charge and synchronize to iTunes simultaneously, with a second dock offering a quick charge for another iPhone or iPod. Nice to know that an expandable, rubberized rest area accommodates Blackberry, and most e-book readers that are available in the market currently. Each purchase will ship with dock inserts for the iPhone, a 36″ sync cable to sync with iTunes, a 12″ USB to mini USB cable for charging devices, a 12″ USB to AC adapter plug for charging Sony Reader, a couple of mini USB to micro USB adapters and an Universal Voltage AC adaptor with folding pins.